MANILA, Philippines - Typhoon Lando (international name: Koppu) has slightly intensified and slowed down as it approaches Aurora Province, state weather bureau PAGASA announced in its 11:00am update on Saturday, October 17, 2015. 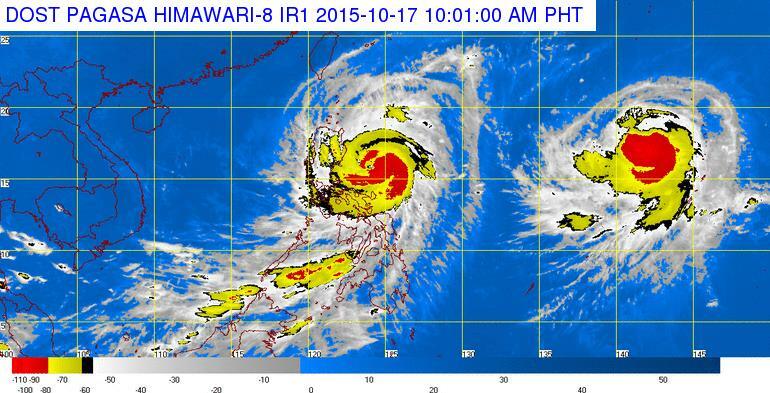 'Bagyong Lando' is expected to make a landfall over Aurora area by Sunday morning, October 18. PAGASA warned of possible storm surge that may reach to a maximum of 2 meters in Aurora and neighboring provinces. At 10:00 AM today, the eye of Typhoon Lando was located based on all available data including Baler Doppler Radar at 295 km East of Baler, Aurora (15.6°N, 124.3°E). It has maximum sustained winds of 160 kph near the center, gustiness of up to 195 kph and forecast to move West at 10 kph. Estimated rainfall amount is from heavy to intense within the 600 km diameter of the typhoon. Fisherfolk are advised not to venture out over the seaboards of Luzon and Visayas and the eastern seaboard of Mindanao. Occasional rains and gusty winds will be experienced over provinces under PSWS #1 while those under PSWS #2 and #3 will have stormy weather.